69-66 before a record crowd (9,906) at the Resch Center in Green Bay. 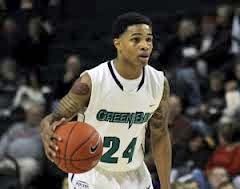 Green Bay Phoenix point guard Keifer Sykes scored a career high 32 points, but his game-tying 3-point attempt bounced off the rim at the buzzer and the Badgers survived. Sykes hit 13 of 26 from the field in 35 minutes to keep his team in it. It was an outstanding performance for Sykes, with up to 17 NBA Scouts in attendance. Unfortunately, Green Bay’s other highly touted player, 7’1 senior center Alec Brown finished with 2 points and 5 turnovers before fouling out. He was a non-factor. Green Bay took a 50-43 lead with 11:30 left to play in the game. That’s when the Badgers took over. Frank Kaminsky hit a 3-pointer and the Badgers went on a 17-4 run over the next 5-plus minutes to take the lead and they would never fall behind again. Kaminsky finished with 16-points to lead the Badgers. Sheboygan native Sam Dekker added 13 points and Josh Gasser 11 for the Badgers, who hit just 5 of 18 three-point attempts. Green Bay was even worst beyond the arc, hitting just 3 of 18.